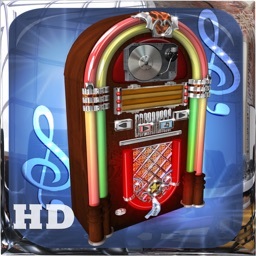 collection come to life with JukeBox HD. 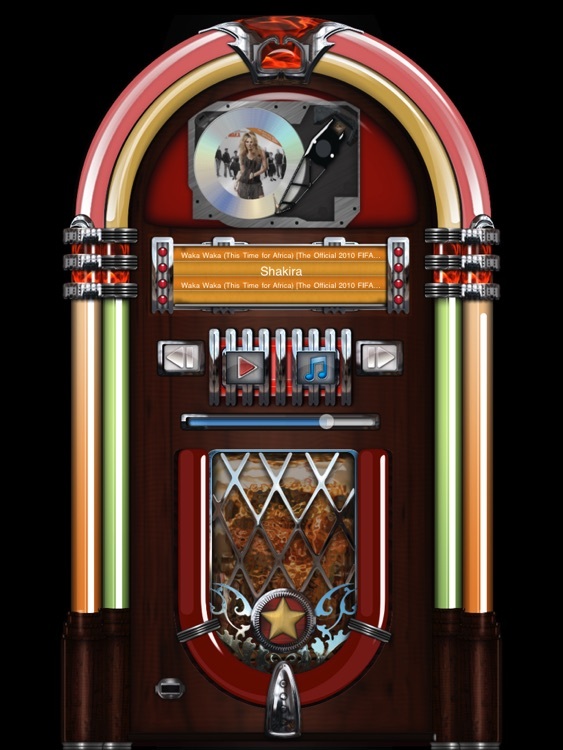 •Animated spinning CD inside machine complete with album artwork provides for an ultra realistic jukebox experience. •JukeBox HD changes to an infinite kaleidoscope of colors, flashing lights all while showcasing a hypnotizing burning flame mid section behind chrome grill. 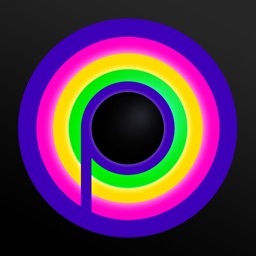 •Easily access and play from your iPads Ipod library music collection. •Background play feature. Listen while doing other things on your iPad. 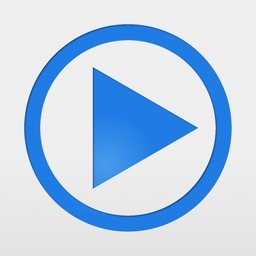 •Easy to use familiar controls for playback and music selection. •Select to auto-play complete music collection and playlists or manually choose play order of songs or albums. 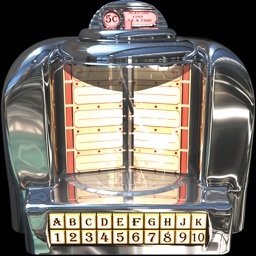 Beautiful flame themed JukeBox art design inspired by legendary Wurlitzer jukeboxes. 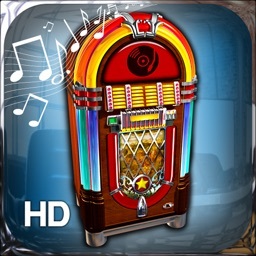 Buy this app today and make your iPad even more magical with JukeBox HD. 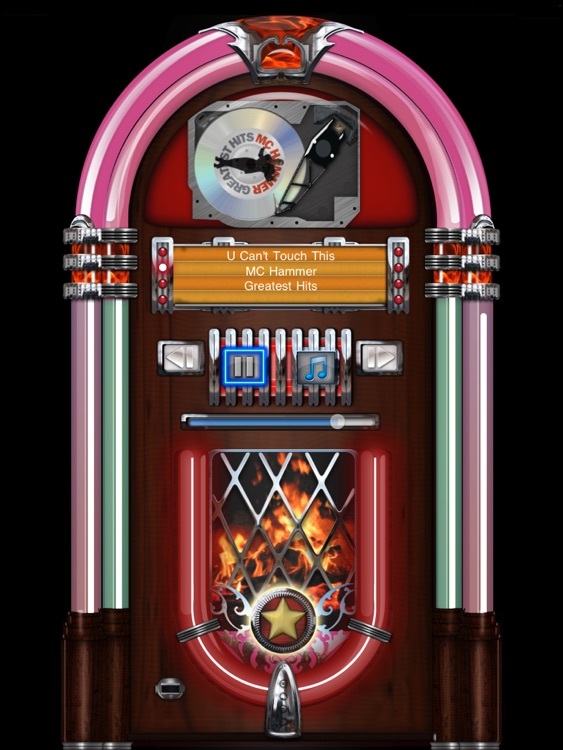 JukeBox HD not only provides a music player but a visual experience as well. Your music comes to life as the neon lights fade into perpetual color combinations with flashing lights and animated flames all while the spinning CD displays your album artwork. There’s even a star on grill that when touched turns on even more lights. Truly a work of art, Jukebox HD displays well next to your home stereo, inside game room, or on a coffee table. Take control of your music and access your iPads music Library. 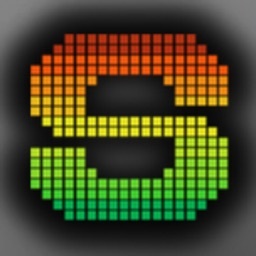 Lets you browse your music collection by song, artist, album, genre, or composer with a touch of a finger. See your music as album art. Scroll through all your albums and simply tap to choose what you want to hear. JukeBox HD lets you auto-play your full music collection with a tap of a button or alternatively select single songs or album and play them in the order you choose. You’re in complete control. Even allows playback of audio books and podcasts. Playing music is only a tap away. Select the music icon to display your music collection. Use your finger to play, pause, change track, and adjust volume. All controls are easily accessible and just a touch away. 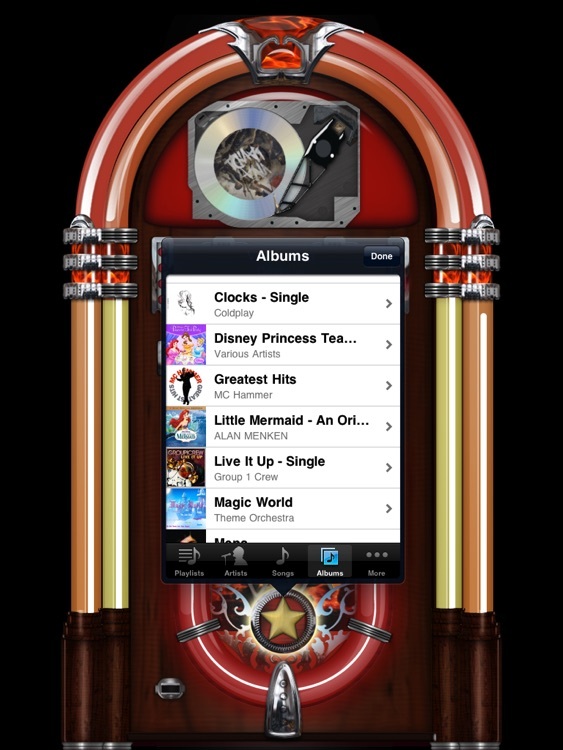 JukeBox HD makes it easy to listen to your music via iPads built in speakers. If you prefer some private listening, connect wired or Bluetooth wireless headphones. Optionally using a separate Bluetooth music receiver and iPads built in A2DP technology you can enjoy the convenience of having JukeBox HD in the palm of your hand while listening through your home stereo wirelessly. 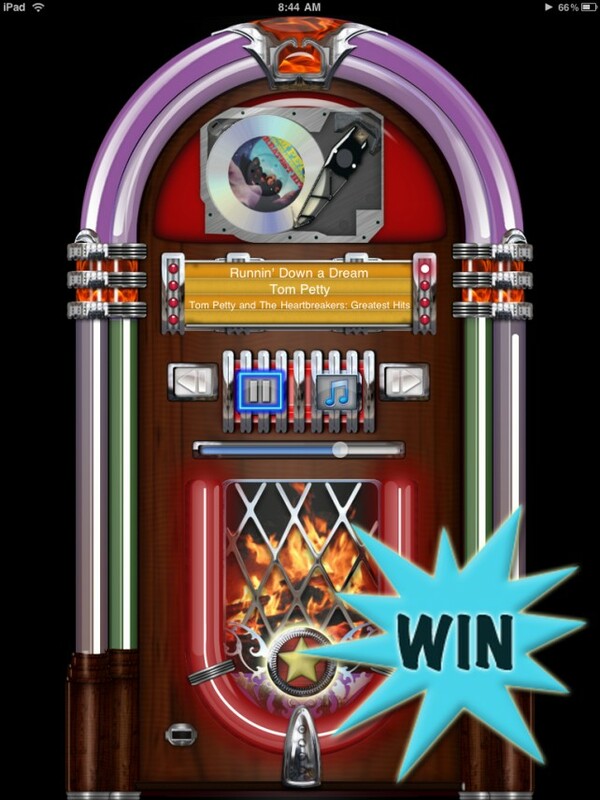 ppAdvice has teamed up with Andy Martinez in order to offer you a chance to win one of five (5) promo codes for JukeBox HD for iPad. ($2.99). Tired of listening to your music collection on your iPad in the same old way? 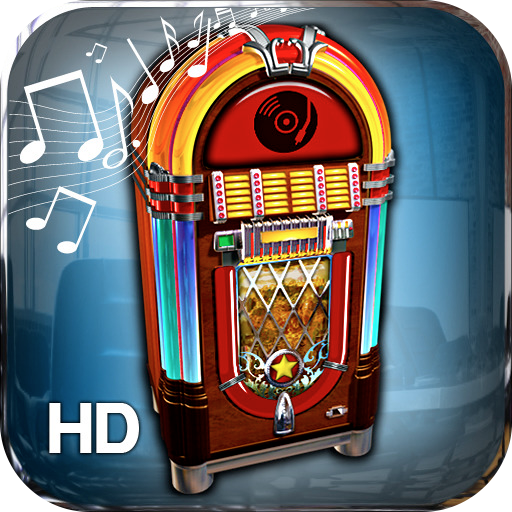 Consider downloading the new Jukebox HD app. Read more..